My next trip to Japan is coming up! And while I am still in the middle of planning I would like to give you an idea of what my plans look like for my fourth journey to the Eastern country. Compared to my previous trips it will be cold for sure. This time I will spend 16 days in Japan, departing shortly after Christmas. The main purpose of my fourth trip is to explore a new side of the country I was not able to experience yet. 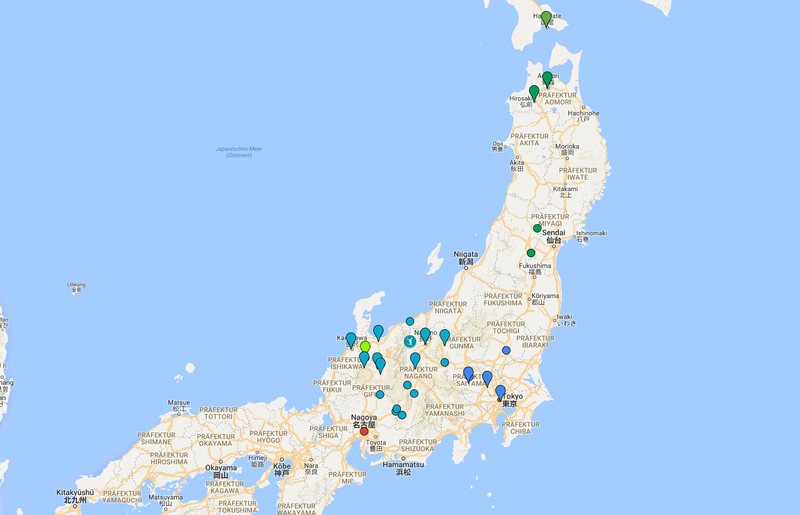 In the Summer of 2012 (yellow pins) I visited large parts of Kanto and Kansai and also paid a visit to parts of the Tohoku region. The next time, in the Summer of 2014 (orange) I also explored the Kyushu region and parts of Hokkaido. Lastly, in Spring of 2016 (purple) I complimented my map with Okinawa and the city Nagoya. 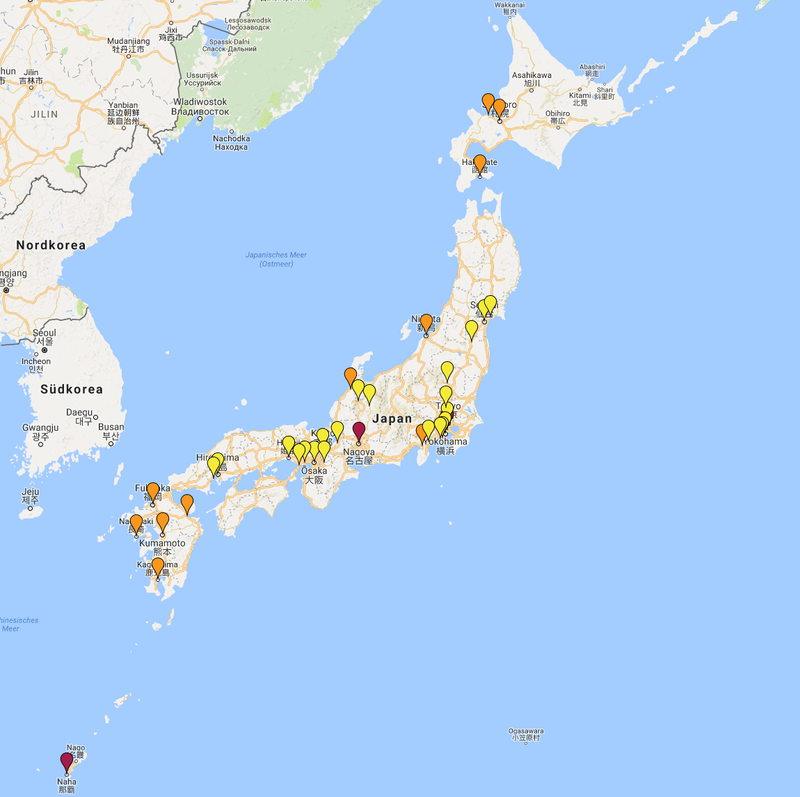 Places in Japan I visited so far in three trips between 2012 and 2016. The main focus of my upcoming trip is the Chubu region in the center of the main island Honshu. This region is a blank spot on my map of visited destinations and I think this should change. Also the season will be an unfamiliar one. Japan boasts about its great deal of variation during the seasons, yet I have come to visit only in Sommer and Spring. The Winter time will offer a very different experience, including scenery, festivities and cuisine. The landscape will surely look quaint covered in snow and ice. Also, there are some seasonal specialties such as nabe hot pots which will only shine during the cold months. 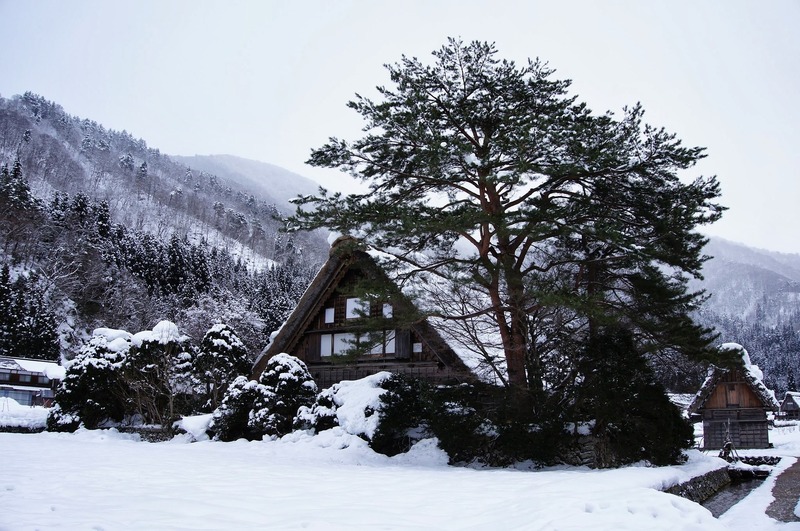 However, some villages I would have loved to visit like Kamikochi are entirely closed off during the winter months. Moreover, traditional houses lack central heating so it will be cold even indoors. Nevertheless I have good faith in the following route that relies on the stable train network. 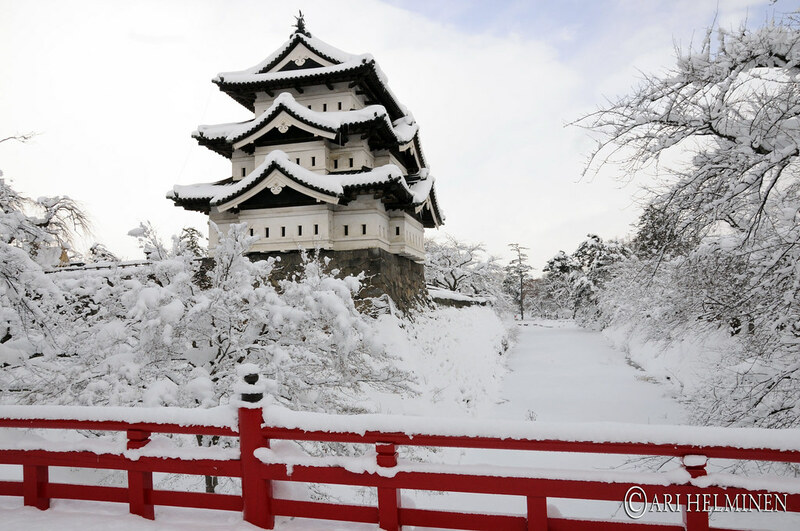 The destinations for my Winter vacation are largely located in the Chubu region. Pins mark definitive, circles optional destinations. As you may know already, I love to write itineraries. Tokyo will serve as my base for the first four days between the years. After flying in to Haneda airport on Dec 29 I try to attend two days of the Winter Comiket which takes place one the last weekend of the year. Having heard many things from friends who attended I am looking forward to experience the enormous doujinshi fair. For the second time I will spend New Year abroad and I am excited to see how the Japanese will celebrate the transition time. For New Year’s Eve I look forward to wrap myself in warm clothes and watch the NHK Uta Gassen song contest on television while pealing mikan tangerines. Early on New Year’s Day I want to attend hatsumode, the first shrine visit of the year, and watch the first sunrise. Also various Lucky Bags will be sold on this day, so I hope to fetch a nice bargain. On Jan 2 the Japanese Emperor Akihito will greet the people on the otherwise closed-off royal palace grounds. The next day I plan to leave Tokyo northbound to explore the northern Tohoku region. In 2012 I visited Sendai and Matsushima, and this time I would like to visit Aomori and Hirosaki at the northern edge of the main island Honshu. 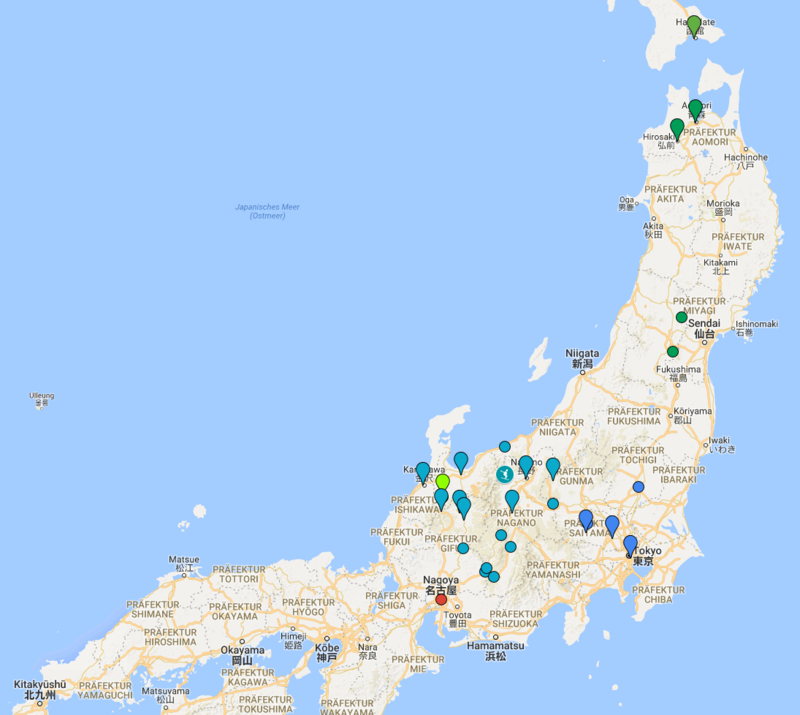 Moreover, I would like to see places in the Akita and Yamagata prefectures, but time constraints render this tour difficult. This part of my itinerary is still fuzzy. In the following eight days I set off for a roundtrip through the Chubu region, harboring the so-called Japanese Alps and cities such as Nagano and Takayama. Beginning in Tokyo I will move along the Hokuriku line to Nagano, and then all the way to Kanazawa. From there I will head to the Gifu prefecture before closing the circle via Nagoya. 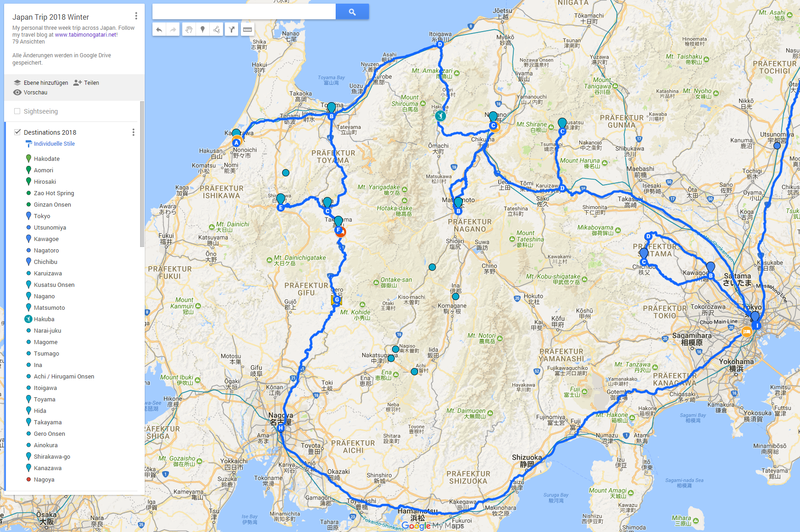 My proposed 8 day round-trip through the Chubu region starting from Tokyo (right middle, then counterclockwise). On Jan 5 friends in Tokyo join me on an Onsen stay in Kusatsu in Gunma prefecture. The town is a popular resort for Tokyoites promising its sulfurous water can mitigate nearly every sickness. From there I will continue to Nagano where I will spend three nights to explore the area extensively. On my bucket list are Matsumoto and its famous castle, the Snow Monkey Park and the Hakuba ski resort. If things work out I will go skiing one day. Following the route of the recently opened Hokuriku Shinkansen I will travel to Toyama and then Kanazawa. I spent two days in the latter and look forward to coming back to this multifaceted city. The day after, Jan 10, I will move to Takayama in Gifu prefecture. 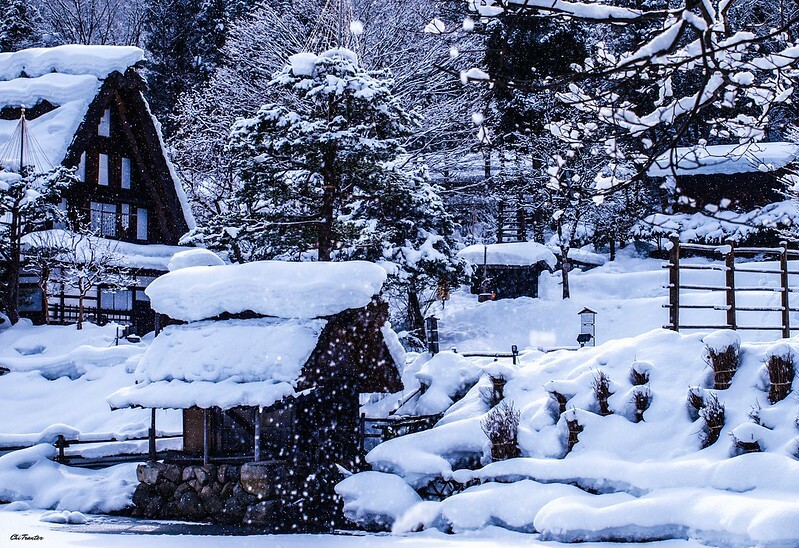 Luckily I managed to find a nice ryokan where I will spend two nights to not only explore the city but also make day trips to the mystic mountain village Shirakawa-go and to Hida and Gero Onsen. The train rides on these tracks are said to be very pleasant and offer scenic views. Lastly, on Jan 12 I will head back to Tokyo via Nagoya and the Tokaido line. There were many more destinations I would have liked to pass by, however doing so would exceed my time budget. For example, I considered going up to the Noto peninsula and see Wajima but access in winter is difficult. Also, the post towns Tsumago and Magome in the Kiso valley on the historic Tokaido route had to be scratched in favor of more time in Nagano. With one additional day left I am thinking about making a stop on the way back. Early on Jan 14, a Sunday, I fly back to Switzerland from Narita airport. Looking forward to all the stories you’ll be able to tell us here. Thanks for the effort!